With 30-40% of the melt already solidified, the amount of heat that normally is cooled away in the tooling is reduced. Rapid S reduces both solidification and the spray time. In total, the average cycle time reduction is 35%. Due to the laminar flow, the air entrapment from turbulence is non existing. The result is, in most cases, a porosity free casting. If porosity occurs as solidification shrinkage, the pores will always be found around the hot spot. Rapid S enables an average of 30-50% reduction of the locking force, and a less complicated shoot curve, which means that simpler machines can be used. The positive result is that a smaller machine can take production from a larger, more sophisticated machine. The part itself can also easily be improved - with more cavities in the tool. Since the temperature can be lowered by some 100 degrees, the surface temperature of the tool is also much lower. The fluctuation between melt temperature and spray temperature radically affects the wear and tear of the tool. A smaller fluctuation gives a much better tool economy. Reduction of the hidden tool costs, such as manual trimming, tool verification costs and time-consuming end customer agreements are also important factors. The possibility of using alloys that used to be impossible to cast, opens up new markets and fields of functionality. 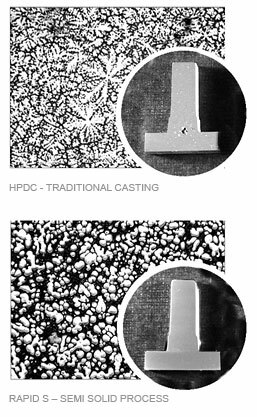 Parts from gravity casting can now be processed in a HPDC machine, gaining time and productivity. The use of low silicon alloy gives better thermal conductivity and improves surface treatment possibilities in addition to better ductility and strength.